Manager Peter Houston conceded that Falkirk rode their luck to reach the Scottish Cup final but was irked by claims that it was not deserved. Hibs boss Alan Stubbs made that assertion after his side lost out to a Craig Sibbald goal at Hampden. "Of course, Hibs were unfortunate not to win the match. I'm straight up on that," said Houston. "But don't disrespect us by saying we didn't deserve to win - we put a lot into the match defensively." Hibs dominated for long spells at the national stadium, with Fraser Fyvie and Scott Allan shots hitting the woodwork. However, the Edinburgh team could not find a way past goalkeeper Jamie MacDonald and Sibbald headed in a Blair Alston cross on 75 minutes to book the Bairns' final place on 30 May against either Inverness CT or Celtic. A disappointed Stubbs said: "There's only one team who deserves to be in the final - unfortunately it's not us (in the final)." But Houston was quick to point out that Falkirk have beaten their Championship rivals three times and drawn with them once in four meetings this season. "After every game we've played against Hibs this season, they've deserved to win, according to Alan," he said. "What he should maybe think about is where we're getting our goals from - crosses into the box. Deal with it. That's what I would do. "As a coach, I'd be saying to my team that we need to stop crosses because every time they put one in they score goals. "Go back and look at the videos - they can't deal with crosses into the box. I'd say that's his problem and not mine. "Rather than say only one team deserved to win he should think about how the team beat you. "That's three times we've beat Hibs this season and we drew 3-3 after being 3-1 down at Easter Road. So I'd be concerning with myself with losing goals, the way Hibs lose them to us." Houston, who managed Dundee United to Scottish Cup glory, also thought his side should have had a late penalty when Botti Biabi was challenged by a sliding Paul Hanlon. "If the final can equal what I had in 2010 with Dundee United, it'll be the best ever," he added. "I would never take anything away from that day as it was only the second time Dundee United won it in their history. "Falkirk haven't won it since 1957 so, with my connections, it would be a huge thrill for me to win it with this club. "That's why I came back into management. If it was another club, I'd have probably stayed scouting with Celtic, going all over Europe. 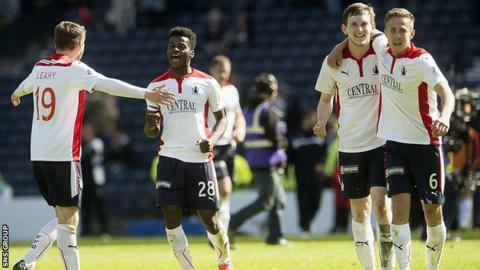 "But Falkirk gave me the buzz again. It would mean an awful lot to win it with Falkirk but I'd never disrespect or disregard the one with United." Stubbs described the result as a "gut-wrencher", lamenting his side's inability to finish off their chances in front of goal. "My reaction is the same as everybody else. It's one of disbelief that we haven't come through that," said the Englishman. "We controlled the entire game and that makes it worse. "It's the worst time to lose in a competition because you are so close but so far. "I just wish we had some of the luck the opposition had today. We have to be more clinical. You have to take your chances."